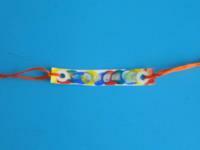 Children will love to wear these simple bracelets. 1. Gather your material. You will need white cardboard, embroidery floss, scissors, a hole-punch, a plastic lid, poster paint (a few colors), and adhesive reinforcements for hole-punched paper. 2. 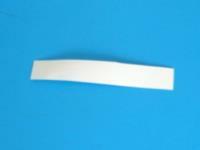 Cut a small strip of white cardboard (10 to 12 cm). 3. 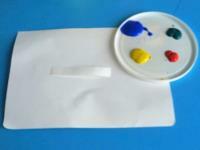 Pour a small quantity of each color of poster paint in the plastic lid. 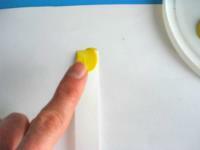 Use the remaining piece of white cardboard to protect the table by sliding it under your strip of cardboard. 4. 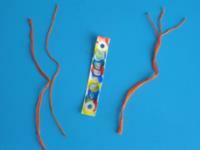 Have children take turns pressing their finger in one color and then on the strip of cardboard. 5. 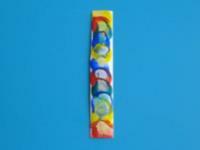 Continue, alternating colors, until the bracelet is full and each child's fingerprint appears at least once on the friendship bracelet. 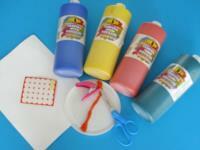 The idea is to mimic the pattern usually created with embroidery floss. 6. 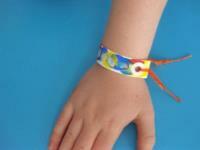 Using the hole-punch, make a hole at both ends of the friendship bracelet. 7. Stick a small adhesive reinforcement around each hole. 8. Cut six short pieces of embroidery floss. 9. Knot three pieces of embroidery floss at each end of the friendship bracelet as shown. 10. 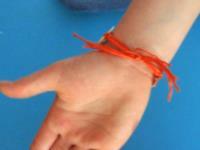 Tie the friendship bracelet around a child's wrist. 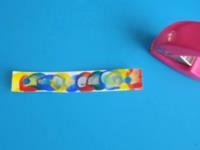 Repeat until each child has his/her own bracelet made with the fingerprints of his/her friends.